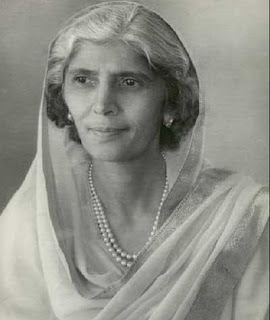 Fatima Jinnah was born on 31st July 1893. She was 17 years younger than her brother Quaid Azam Muhammad Ali Jinnah. She was just 2 years old when her mother passed away and at age of 8 she also lost her father. At this difficult time Quaid Azam looked after his younger sister. She passed Matric in 1910. in 1922 she got degree of dentist. Fatima Jinnah always supported her brother Muhammad Ali Jinnah in struggle of freedom. in 1938 she became permanent member of All India Muslim League. She played important role in women wing of Muslim League by participating in different meetings and Jalsas of the party. When Quaid Azam's wife passed away it was Fatima Jinnah who looked after her brother. in 1964 Fatima Jinnah contested elections against Ayub Khan but she lost due to cheating of opposition. On 9 July 1967 she passed away and was buried near grave of Quaid Azam on her wish. Fatima Jinnah got title of Madir E Millat mother of the nation. she is an inspiration for every Pakistani women.